I studied hospitality in the North of France and started at La Grenouillère, a Michelin star restaurant. That’s where I learnt how to mix flavours, colours, texture. But it was not social enough for me, so I work a little bit on the floor to be closer from the client, and understood that the bar would be the right middle ground for me. 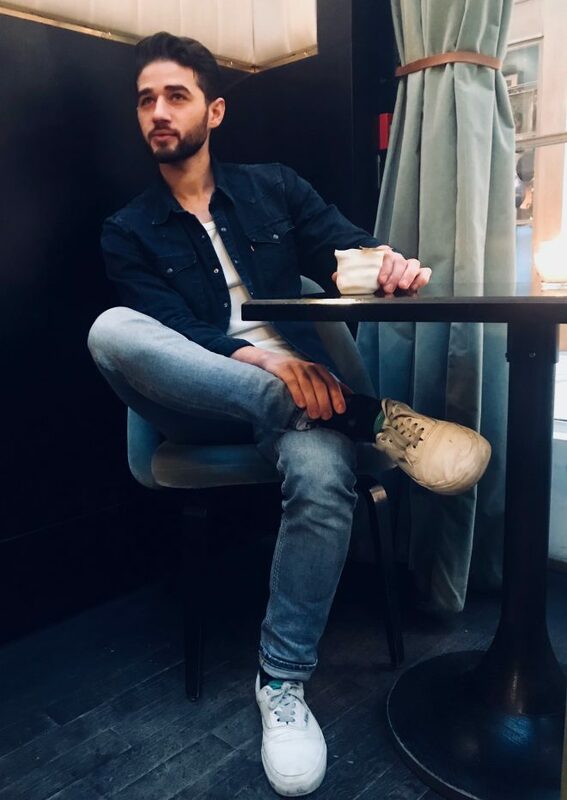 I moved to Bordeaux to be graduated in bar specialization and at the same time working in Le Grand Hotel de Bordeaux as an apprentice bartender for a year. I read a lot, but all the books were in English, so I understood, that maybe there were more to learn abroad. So I moved to London to work for the EEC Chinatown without speaking English, where I started as a barback for a year. I learnt a lot about cocktails at that position and improved my English too. I think now the new generation wants to dodge this step, and that’s a pity, even if it’s not a fun position every day. But barback is a key position in a bar. At the same time, I met Nico de Soto who was working at Happiness Forgets before his own opening in New York at Mace. I couldn’t join him in New York, so I stayed as assistant bar manager at the EEC Chinatown in London. Then Nico contacted me for the Danico project in Paris end of 2015, for an opening summer 2016, with a position of bar manager. I said yes and went to New York and around the world to work with him before the opening of Danico. These trips around the world enriched me too thanks to the discovery of flavours, products… Young bartenders should travel too to learn a lot of stuff. And now I am here for the last 2 years. That was a challenge because I was young and for instance, team building was not the least one for me. But when it works, you can feel the difference in a bar, even for the customers. Today my team is great, like Guillaume who started as a barback and who is now behind the bar, with a great rum knowledge. Ilan who used to work at the Blind Pig in London who gives this UK point of view, or Tony and Roberto who have this Italian touch. We are all different but complementary and we work all together for a greater good. My dream bar today would be in a big city like Paris, to have different types of clients. It would be the same size as here, like 50 seats, and the felling would be a warm-up for people who’ll go to party. This feeling comes from where I grew up, the North of France. Could be in a pub or a bar, there people prepare their night before clubbing and are happy to share this conviviality altogether. So the cocktail list would be easy to drink but creative with good products, no need to be fancy. Don’t forget that the cocktail is only 30% of the experience. It’s about the mindset, the design, the music and that’s why people came back. So my design would be more raw material, wood, steel, waxed concrete, quite dark with electro music and hip-hop music from the 90’s. Of course, finger food will be part of it, because it’s needful, with why not a signature sandwich. You can see restaurants that have their own bar now, for instance in Paris Carbon, Marrow, Dersou. I try to get up not too late so I can go to sport at the end of the morning. Otherwise, I try to go out of Paris to make photos of nature or visit museums and arty places in Paris. In the evening I love to go to restaurants. Rum because it’s versatile, and my grandfather is from Martinique, so I’ve always known this taste. You can stir it or shake it. It can be in a tiki drink or a short one. If it’s a Jamaican rum or an overproof it will be totally different. Even if like all type of rum, I really like the Plantation brand. Here we rework a lot the spirits we have, and when it’s about rum, we love to use Plantation rum for it. Balance. Look a daiquiri it’s just 3 ingredients: rum, sugar, lime. The balance will make the difference. So whatever the flavours, it’s going to be about balance. I love to use fresh herbs. For instance, in a previous menu, I made a kind of lassi with sorrel and dehydrated milk. In this one you’ll find a homemade parsley syrup, I’ll show you in my signature cocktail. I really realized that working at Danico, maybe my cooking background. You need to go to Operation Dagger in Singapore to meet Luke. I’ve been enough lucky to meet him twice, he has a real vision about cocktails. Now cocktails are more than just classics with a spirit, a vermouth and a bitter. We use more and more cooking technics, like rotovap, centrifuge… and it’s a game changer. There is more and more a merger between foods and cocktails. In France, you have to go to Bordeaux to visit Symbiose with Lucass, Simon and the chef Felix. It’s extraordinary there, I am a big fan.